The lesson of Dayna Hopkins is as important as the gift that she created and presented to me on the last night of class. Dayna is unique, as are all learners. She has her own approach to acquiring, generating, and transforming knowledge. I would even describe Dayna as somewhat of a round peg in a square opening, which has caused her grief throughout her schooling. She comes from a history of school experiences that often mandated that her assignments be done in one way and only one way. The artist in her rebelled. For the major writing assignment of this particular class, Dayna surprised and delighted the class and me when she turned in the representation of her learning of the three perspectives of pedagogy mentioned previously in this text, shown in Figure 1.1. I wish to thank Dayna for her art, her story, and her willingness to share with us all. Enjoy Dayna&apos;s explanation of her art in her own words in the box on page 8 & 9. Thank you, Dayna. At the bottom of the picture is a representation of the transmission model, often referred to as the banking model. The teacher is talking in front of the class. You will see that her words are going in one ear and out the other until they get to the student who is daydreaming in the back of the class. The words just bounce right off of him. You will notice that the first student has a picture of the subject being taught, but it is not a very realistic picture, as this child does not have the experience to fully understand what the teacher is saying. The second child has a question, but in this model, many questions are not answered because most of the communication is planned and prescribed, which ignores the needs of the learners within the class. Please note also that the communication flows in only one direction. The last child represents the students who have difficulty attending to the lesson. To the right side of the transmission model are the roots and base of a plant, which represents the fact that this model of teaching stresses planting and germinating of knowledge and eventually leads to knowledge sprouting up in the learner. This is the model of education that I experienced when I was a student. This is in the middle of the picture. Please notice that in this model of education, the teacher and learners are much closer to each other. Here, the communication flows in several directions, so many more questions are answered for the learner. The child visualizes the flower in a much more realistic way because he or she has been given a more hands-on approach to learning. However, the child can still get an unrealistic visualization, as this method is still limited in that the real world is outside the window. To the side of this picture are the stem and leaves of the plant representing the generative model&apos;s statement that it is not enough just to germinate and sprout, but the learner must show growth as well. This is the model that I learned during my student teaching. It is also the model that I tend to practice as a teacher. This model of education is at the top of the picture. With this model, the learner gets out into the real world and participates in real activities; thus, he or she gains realistic pictures to visualize and to experience. The communication flows freely from learner to learner, and the teacher becomes a partner in the learning process. One child is wondering, “What if we pollinate this flower to be a different kind of flower?” This represents the idea that the transformative model encourages students to create something new with the knowledge they have. Another child is saying, “We could give some of what we grow to families that need it.” This represents the fact that the transformative model involves interaction with the community as a whole. 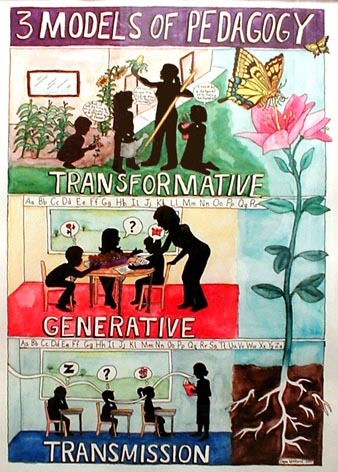 The last child is thinking, “I could be a botanist or a horticulturist.” This represents how the transformative model inspires learners to see what knowledge can do for them in the future. To the right side of the transformative model are the flower and the butterfly, representing the idea that it is not enough just to germinate and sprout or just to show growth, but the learner should also blossom and go out into the world and reproduce to create something new. This model I am just beginning to understand, and I am aspiring to teach from this perspective whenever possible.